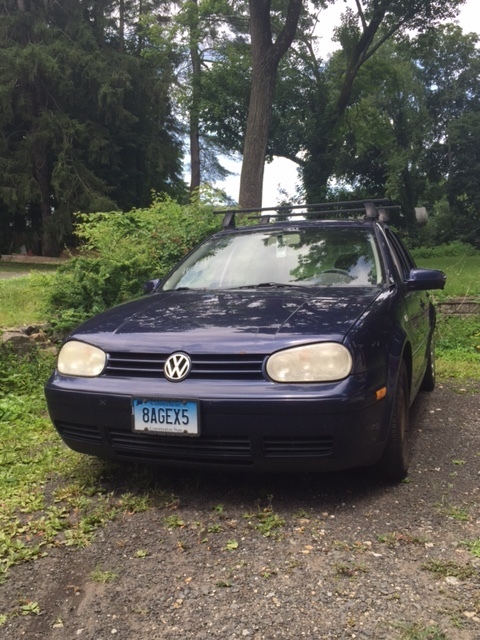 This afternoon, I’ll say goodbye to my Volkswagen Golf. This ending is not exactly how I thought it would be (are they really ever?) but it’s a pretty good one, and I have no complaints. 13 years is a pretty good run, and, it’s time– people I don’t even talk to anymore last knew there were problems with it years ago. But like many problems, the car’s issues seemed to fade in and out of focus in my life– an electrical problem from 2006 where my radio stopped working for a few days seemed to resolve itself, as did issues with the oxygen sensor, whatever the hell that is, as well as a plethora of other issues that surfaced and recessed again when other things in my life took more of a center stage priority. Still, not all the car’s problems disappeared just by me ignoring them– some things seemed to really go away on their own. I did take care of the car as close to how any normal person would have over the years, but now that the front and rear brakes have “went,” (that’s oldcarspeak for gone) the cost of repairing them exceeds what’s worth it, even to me, and I’m bad at math. I have dealt with the smoke pouring out of the back of the car for years (it doesn’t always happen if you know how to start it right). I have managed well with a broken mirror case on the driver’s side (you just have to get really low in the seat to kind of see who’s behind you– it’s fine) for the past year, I removed most of the mold that set in when the car developed a leak and I didn’t realize it, and I know all the tricks, like how to get the headlights and the cupholders to cooperate. I know how fast I have to drive to now allow the fumes to stay too long in the car, and I’ve adapted to the lack of AC. People went for many years without it, so why should I complain? As mentioned above, there were times when I didn’t drive the car. Circumstances beyond what I can explain in the scope of this blog allowed me to drive three other cars during last 13 years. knew those other cars were temporary, although to what extent I was never sure, but I always figured I’d have the VW as backup. This “backup” concept went well with other ideas I’d had over the years: by securing backups in all areas of my life, I’d be safe, protected, ready for anything. You could have a backup outfit, a backup major (or two), a backup job, how about a backup career? a backup boyfriend, a backup pair of shoes in the backseat of the car, backup weekend plans, backup friends in case you got separated from yours, backup dinner in case the recipe failed, backup conversation topics… so why not have a backup car in the driveway? Makes total sense to me. Yet, my trusted advisors tell me this is not something that normal people have. And having a backup vehicle collecting mold in the driveway puts me closer on the spectrum of reaching that “yard full of cars” look that is not a life goal. I said goodbye to my first car, a 1990 Subaru Legacy, in one of those really sad ways you don’t want: I watched it go down Lee Mac Avenue in Danbury on the back of a tow truck, front smushed, headed to the junkyard. An accident had cut short my secret dream of reaching 200,000 miles in that car. I think I was around 180k at the time, so I was pretty bummed. But I wasn’t immune to the “new toy” feeling of getting in my brand new VW, driving the 40 minutes home from the dealership. Fascinated with the blue and red lights of the interior, I sat in a car that was a year we weren’t even in yet, enjoying the “MONSOON” sound system, feeling like things were going to be okay again. Sure, “it’s just a thing” — I’m living in reality enough to know that. But I think more people can relate to the sadness than not. At the heart of the matter it’s symbolic of another major change in my life. I was laying in bed awake at 4:30AM, thinking about this, wondering how I could get from the bed to the computer without forgetting everything that has mostly lost its brilliance in transit: so many things are changing in my life at once, my head is often spinning in a way I can’t explain. Lots of people tell me I don’t need to explain, because they understand, but that doesn’t stop me from wanting to explain. I guess I’m at the point where it’s finally okay for many things to change. Like I arrived at a tipping point of some magnitude, and things that have been waiting to fall into places I didn’t even know they belonged are falling into their places. And I’m watching like: whoa. I will miss my VW. It went with me to the tip top of Maine, where you start to question if you’re very far north, or very far south. It went to North Carolina, to Tennessee, and all the states in between (almost all of which have a town called Manchester). It went to Cape Cod and upstate New York so many times I imagined it knew how to get there on its own. It heard many conversations never to be spoken of again, and held many people who have come in and out of my life. It’s been stuck in three feet of mud, many more feet of snow, and managed to get out of every jam. It’s resided at five different addresses. It’s been to more concerts than some people. It’s carried dogs, construction materials, Christmas trees, and all my worldly possessions. It has bumper stickers that make no sense to anyone but me, and people stopped asking me about them long ago. I love how it drives, even now, at the end. It is the last car built in the 2000s I know of with a tape deck. I loved this fact, but didn’t really listen to tapes too much. It most often held the same cassette, a “Leaving Connecticut Mix” made by someone I loved in 1996. I love old cars, and even though our definition of “old” is ever-changing, getting maximum use of out something makes me happy. But it has to go. A driveway, like a mind, can get cluttered. The past is meant to be referenced occasionally, not lived in. In order to begin the next phase, this summer and fall, I need the right tools for the the job. So my husband-to-be-in-17-days, my dad, and I are going to pick up my new car in a few hours. Not a VW, but still a stick shift. I’m one of those holdouts. We are going put the AC on HIGH, enjoy a smokeless ride home, and not listen to a tape. This entry was posted in Cars, memory, secret car mechanic inside my head. Bookmark the permalink. 6 Responses to I know you rider, gonna miss me when I’m gone. My 2005 Ford Ranger has 251,000 miles, a tape deck and is my second car. My new car with 3,000 miles is a Subaru Crosstrek with all the bells and whistles…cameras front and rear etc but no tape deck. It is nice but I can’t bring myself to the point of divorcing the truck, it I family and home even though I pay taxes and insurance on 2 vehicles. Enjoy your new ride and don’t drive past your exit. Nostalgia in the moment is such a strange thing. I get the backup (although no, I’ve never done it with a car) but I also get the excitement of walking away from the old but keeping the memories and lessons learned as you walk toward something new. One of your best; I especially like the concept of referencing the past, not forgetting it, yet not living in it. I still remember a 1937 Plymouth named Betsy….hitting on all 4 cylinders when we traded her in. My condolences. Reminds me of my first car, Vivien, a 1973 Volvo. Her odometer stopped working at 180,000 – I guess that’s the equivalent of 39 years in Volvo miles. She rests now at the LaJoie Car Cemetery in Norwalk. She will welcome your beloved Volkswagon at the pearly car gates. Did you take a picture of the bumper stickers? I did… I’ll post it. 🙂 Thank you for reading.